We’ve forecasted that adaptogens will be taking over in 2018. And why? Because we honestly reallyneed them. It seems that the world has become swallowed up in stress more than ever before, and because these herbs are stress-fighters — and stress can impact so many areas of our health — we anticipate that everyone will be reaching for these natural wonders to help restore physical and mental balance. 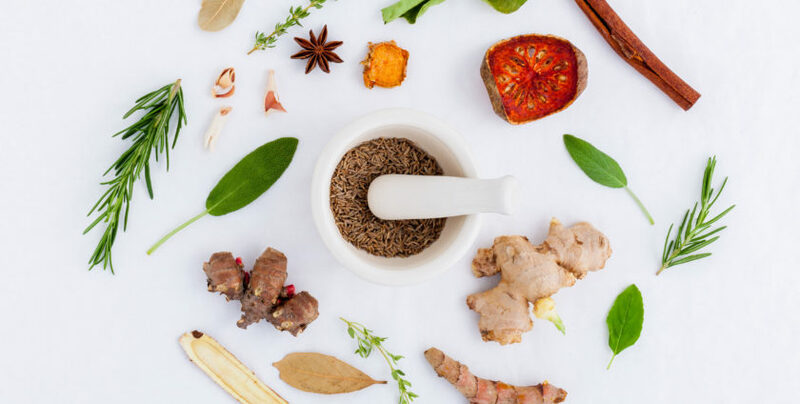 A brief refresher course: adaptogens are herbs, roots, and mushrooms that can help with stress, anxiety, sleep, your immune system, and more. They’ve been used in naturopathy, Ayurvedic medicine, and Chinese medicine for centuries. Some examples (that you may recognize from your favorite health food café or packaged foods): ginseng, holy basil, eleuthero, ashwagandha, reishi, astragalus, sea buckthorn, rhodiola, and cordyceps. “Given all the negative consequences of persistent stress, the use of adaptogens can be used as part of a holistic strategy for improving one’s health,” said Tieraona Low Dog, MD, author of National Geographic’s Fortify Your Life: Your Guide to Vitamins, Minerals and More. We got a little intel from the health and wellness genius on how adaptogens will significantly impact your life. “Another common symptom and cause of stress is poor sleep,” said Dr. Low Dog. Ain’t that the truth! “[By] allowing us to tolerate stress more effectively, the calming ashwagandha has also been known to improve sleep,” she said. “Ashwagandha is best for those who have a chronic stress that’s accompanied by irritability; incorporating the ancient root into your routine can help support relaxation and restore healthy sleep habits.” Zzzzzz. Because stress impacts your body’s sleep cycle, your energy levels the next day can suffer. It’s a vicious cycle, isn’t it? This is where rhodiola comes in. “Rhodiola has been used for more than 3,000 years in Europe and Asia to increase energy and endurance,” Dr. Low Dog told POPSUGAR. “It has been shown to have a beneficial effect on the regulation of stress hormones, improving fatigue and mood.” Can we get some of that?! If you’re thinking — “But wait, doesn’t ashwagandha do that? Why do I need more?” — it’s not quite the same. “In contrast to ashwagandha, rhodiola is considered to be a more stimulating adaptogen, making it best for those who have fatigue, low energy, and depressed mood,” said Dr. Low Dog, so this adaptogen is better for daytime use. Back to that vicious cycle we mentioned: poor sleep, crummy energy and mood . . . and as you may have guessed, foggy brain and difficulty focusing. Rhodiola to the rescue. “Chronic stress can reduce your body’s ability to regulate inflammation, leaving it unchecked,” she said. Yikes! Let’s introduce one more adaptogen to the mix. Dr. Low Dog concluded, “Eleuthero is a good choice for those who are under considerable stress, but do not have either marked irritability and anxiety or chronic fatigue and depression.